Green Collar Jobs: A Pathway out of Poverty? Amanda MacDonald is a recent graduate of Phillips Academy Andover, where she was President of the campus sustainability club. She will be entering Rice University this fall. Poor, inner-city areas are often the worst hit by both environmental issues, such as air pollution and limited access to fresh food, and high unemployment. This makes them great candidates for urban greening movements. Specifically, green collar jobs have been touted as a “pathway out of poverty” by advocates such as Van Jones, head of Green for All and author of The Green Collar Economy. Pro-environment programs in low-income areas are an ideal, albeit challenging, method for tackling two of our nation’s biggest problems – unemployment and environmental degradation. For example, the South Bronx has a reputation as one of New York’s most dangerous boroughs, as well as one of the most polluted. Grassroots organization Sustainable South Bronx (SSBx) addresses both of these pressing needs with a single solution — providing training and jobs that benefit the environment. “Little by little we’re seeding the area with green collar jobs,” says Majora Carter, founder of SSBx. The organization’s B.E.S.T. (Bronx Environmental Stewardship Training) Program provides residents with training for careers in ecological restoration, landscaping, green roof installation, hazardous waste cleanup and home weatherizing. By providing stable jobs, SSBx combats South Bronx’s severe unemployment, which has reached 35% in some areas — and with one of the highest asthma rates in the country due to the disproportional amount of diesel truck traffic and waste facilities, the borough could certainly use the environmental boost. People’s Grocery in West Oakland began nine years ago by simply providing cheap organic produce to residents via its Mobile Market — a brightly painted truck that played music as it drove through poor neighborhoods. Today, the organization’s numerous urban agriculture, nutrition and enterprise programs have become a model for other organizations across the country. Now run by both organization members and West Oakland residents, the People’s Grocery operates a leadership development program that provides partnership opportunities for residents with ideas for their own food and health projects. 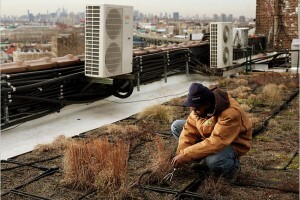 In the state of New York, inmates are sent to boot camp gardens to prepare them for a green collar career; the same program is currently developing a solar panel farm. In California, the RichmondBUILD Green Careers Academy steer residents of Richmond, CA’s most violent neighborhoods away from a life of crime by providing training for — yes — green collar jobs such as solar installation. Theoretically, the promise of green collar jobs provides solutions to both the economic and environmental crisis for all Americans, not just the impoverished. As the United States steers away from fossil fuels and towards alternative energy, millions of jobs could be created for everything from reworking of buildings to an overhaul the electrical grid. Accordingly, green jobs were a hot topic for both candidates in the 2008 presidential election, with Obama promising to spend $150 billion over the next 10 years in order to create 5 million jobs. Despite success stories like SSBx and official optimism about these goals, actual progress in the creation of green jobs has since been disappointing. Part of the problem was an overestimation of consumer interest in and demand for sustainability. For example, as of 2011, the California Energy Commission had spent a disappointingly small proportion of the $186 million federal stimulus money granted to weatherize homes, and only about 538 full time jobs have been created through the program. Similarly, although RichmondBUILD brags of a job placement rate of 80% on its website, only about 25% of graduates find work with solar or energy efficiency companies; the rest do traditional carpentry or plumbing work. Washington has also taken some of the blame for the slow progress of a green economy. Cap-and-trade legislation would have made alternative energy more competitive, but Congressional gridlock killed these efforts. Additionally, many green collar jobs can be outsourced just like any other. For example, solar panel company Sol Focus, although based out of San Francisco, bases the majority of its jobs in its Chinese factories because “taxes and labor rates” were too high in California. Opponents call the Obama administration’s push for green jobs a failure and waste of money. From a short-term perspective, this surely seems to be the case — Americans need jobs now, and green job creation has been lagging. But if we care about a sustainable future, shifting jobs away from oil and coal and into the green collar sector seems to be our only bet. As of now it appears that a green economy of the scale promised by advocates in 2008 may only be a pipe dream. However, despite its rocky start, America’s green economy could pick up with increased environmental awareness among Americans and better-organized governmental incentives. Organizations like SSBx may have to struggle, but for these Americans, the only choice seems to be between green job creation or poverty. Now more than ever, Americans need to show our government and each other that we care about our future.